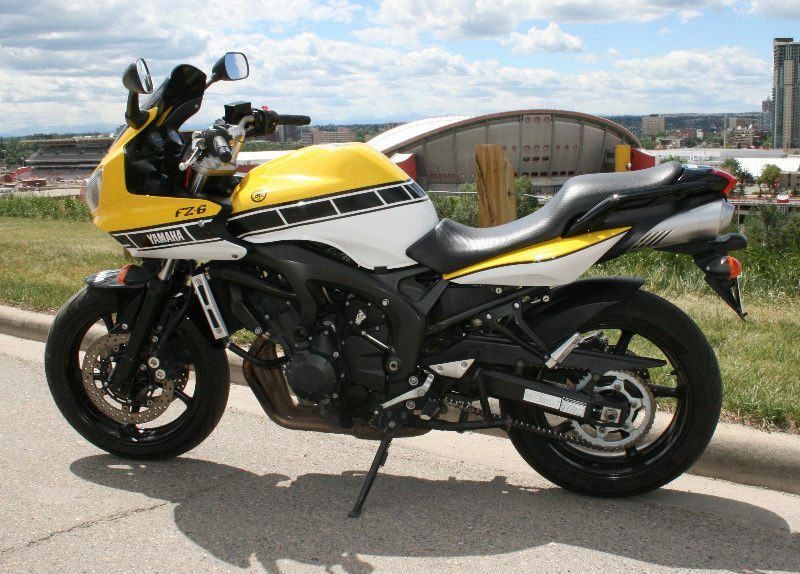 From 2004 to 2010, Yamaha sold the FZ6 Fazer, a sport-touring motorcycle that featured a detuned R6 engine (circa 2003) and sporty styling, but with a more comfortable and ergonomically-friendly riding position. As the owner of a 2007 FZ6 in Yamaha 50th Anniversary colors, I’m happy to write an article extolling its virtues. If you’re reading this while contemplating making a purchase, know that you’ve got your eye on a good bike. However, as good as it is, it isn’t necessarily the best bike for everyone. But it is a good bike for new/intermediate riders that want some predictability in their power band (and thus hopefully preventing unexpected wheelies), a more comfortable riding position than the typical sportbike, and class-leading reliability as well. The previous three points describe the needs of most new riders… or most riders (if I’m honest). What Makes a Bike a Good Beginner Bike? A good post that helps provide context around the answer to this question was written about a year ago by my friend and colleague, Jim Pruner. Check it out first. It is inexpensive enough that you won’t be upset when you (almost certainly) drop it. Buying something shiny and new will only make the heartbreak associated with said damage worse. Get something used at a price you won’t be upset about if it gets dinged up. The power is manageable and, equally as important, predictable. Many people opt for sport/supersport bikes for their first go around, and it’s often to their detriment. Having predictable power will ensure that you don’t surprise yourself in a corner. The bike is reliable and doesn’t require intricate or constant maintenance. Make no mistake – all bikes need to be maintained – but some are less finicky than others. Pick one that lets you spend your time focused on riding instead of wrenching. You can fit on the bike comfortably and manage the weight without assistance. Many people make the mistake of buying something too big or too small. You want something that sits in the Goldilocks zone (ahh, juuust right). Unsure of what to be looking for? Here’s a great piece (also from Jim) to get you started: Determining the Correct Size of Motorcycle for an Ideal Riding Position. Consider this: the odds of you dumping your bike are high, and that’s okay. I mean, it won’t feel okay at the time, but most bikes belonging to new riders hit the pavement once or twice before said rider develops the skill and confidence needed to handle the bike with ease. 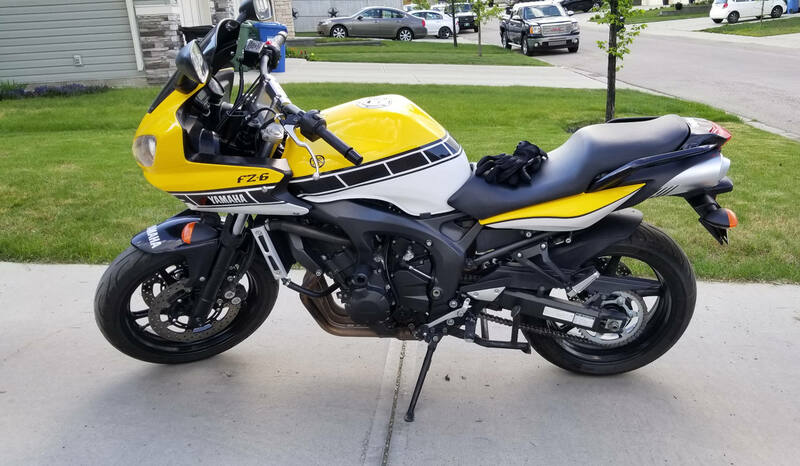 My first bike was a 1999 Kawasaki Ninja 500R and, honestly, of the four I’ve owned – including an ’08 SV650S, 06 Katana 600, and now the ’07 FZ6 – the Ninja is my favorite (largely due to nostalgia, but I digress). Its light wet-weight, adequate power, and comfortable ride made it a real gem to learn on and build confidence with. Unfortunately, I grew out of it in a year since my (at the time) 230lb self was a fair amount for the 500cc engine to haul. I bet you the 500 would have felt much better with my now-188lb frame. Knowing what I know today, I’d have grabbed a Ninja 650R or the FZ6 I now ride. Both bikes offer plenty of power – but not too much – and will keep a new rider smiling for several years. A good beginner bike is one that helps you build confidence when riding; a great beginner bike is one that you’ll hate to let go of years down the road. The FZ6 is the latter. The 2007 model in my garage came in at just over $3,000. Granted, it has about 24,000 miles on it, but these engines are reliable and, when maintained, will last double or triple that with minimal hassle. Yamaha is deserving of their reputation for building some of the most reliable bikes around. At a hair under 460lbs (456lbs to be exact), it’s also fairly lightweight for a 600cc bike, making low-speed riding and maneuverability easier than something heavier. Finally, the returned former-R6 engine has its engine map optimized for mid-end power, reducing the “power peakiness” that sportbikes are known for. For a new rider, this gives them the coveted predictability needed from a great first bike. Oh, it also has a built-in center stand. That in and of itself is a win. All told, the FZ6 is a heck of a package. With 98hp and 46.5 ft-lb of torque on tap, the FZ6 is by no means a slouch. Those figures aren’t Earth-shattering, nor are they even class leading, but that’s not particularly relevant when looking at the larger picture. 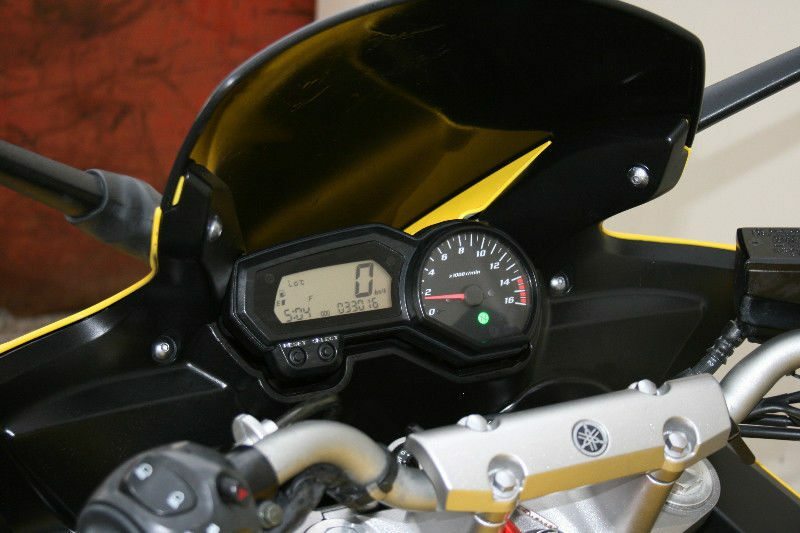 What those numbers do mean is that an intermediate rider – or even an advanced one – will find plenty of power available, especially when the tach climbs past the 10,000 mark. Newer riders keeping the revs a bit lower will find a compliant and easy to manage bike, and once the throttle gets twisted, they’ll soon find themselves climbing towards a three-digit speedo. That is what makes the FZ6 a great bike for nearly any rider: a new rider can approach it with confidence, and an experienced one will appreciate the power band, chassis, and braking. The Fazer is a sport touring motorcycle, and appending touring next to sport actually does mean something. Compared to the R6 that its engine is derived from, the FZ6 is more upright, more relaxed, and more comfortable. The suspension is a little looser, providing a ride that is more forgiving over bumps, but not so loose so as to lose the feel that makes these bikes great. One thing about the FZ6 that I appreciate, and that most wouldn’t consider, is the heat coming off the engine. When you’re at a light, and it’s already hot outside, sitting with your legs wrapped around a portaheater isn’t the most fun. I find the FZ6 quite manageable, as most of the heat seems to be expelled behind my legs as opposed to inline or in front of them. During hot summer days this makes riding just a little nicer. As someone with an L5/S1 back herniation (from 2010), as I noted in my first-ride of the Kawasaki Z650, the upright riding position afforded by the FZ6 is much more manageable for longer rides than the hunched-over position you get on a sportbike. You don’t hunch on the FZ6 (well, you might if you’re short, but at 6’1″ I don’t), and that fact alone makes it a low-back favorite. The 2007 and newer models had a refreshed instrument cluster, which offers some improvements compared to the previous model years. Most notable is the analog tachometer, replacing a digital version that many found hard to read. Also on the cluster is a clock, two trip computers, fuel gauge, and temperature sensor. The “at a glance” view offered by the cluster is easy to read while at speed, and that’s all you can really ask for. The cluster sits behind a windscreen that, for the most part, does its job well. At highway speeds, I get some buffeting, but I suspect people that come in under 5’10 “would be fine. The mirrors are as good as any other bike and do their job adequately. The seat is also quite comfortable, though not the best I’ve ever sat on. That distinction actually rests with my old SV650S, though I’m pretty sure that seat was aftermarket. In any case, my buns feel just fine for a couple of hours at a time. No complaints here. Aha- this is where bikes of this class really shine. Despite being a little less stiff than a sport or supersport, the suspension and chassis in the FZ6 is plenty sporty. It dips into turns easily, maintaining composure throughout the corner, and pops back upright almost as soon as you think of it. The linear power also makes corners less daunting than more peaky engines, as it’s quite easy to predict how the bike is going to react at a given RPM. Braking is also quite good. 2007+ models have brake calipers that are monoblock four-piston units (from the R6S) and afford the FZ6 excellent stopping performance; 2004 – 2006 have 2-piston units. All model years have a single-piston rear brake. The FZ6 is not without its faults, and it’s here that you begin to find them. The engine, which delivers maximum power at 12,000 rpm, will vibrate the handlebars when you’re cruising in the 6,000 – 9,000 rpm range. Staying lower than 6,000 results in sluggish performance, and once you’re above 9,000 you’re approaching peak power- something new riders need to be cognizant of. Secondly, the FZ6 lacks an integrated cruise control, so you’re in charge of maintaining throttle the entire time. 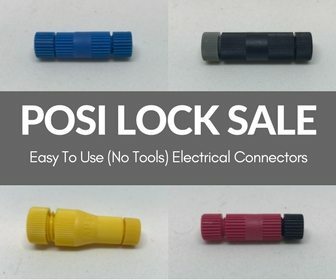 You could use a throttle lock, but we all know how hit or miss (mostly miss) those are. If you really love your Fazer and want to bolt cruise on, you could look at a kit from MCCruise (that Jim recently reviewed at WebBikeWorld), but now you’re talking spending $500 or more on a bike that was only $3,000 to begin with. Still, the comfortable riding position, nice seat, and windscreen keep the FZ6 enjoyable to ride for mile after mile, despite some buzziness in the handlebars. 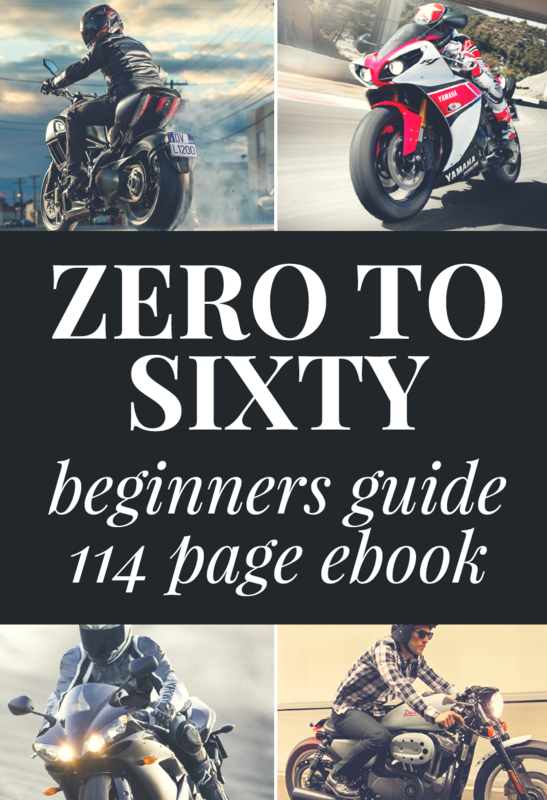 The wet-weight of the FZ6 is around 456lbs, making it quite light and lighter than many of its peers (with the notable exception of the Kawasaki 650R, which rings in about 20lbs lighter). While 460lbs isn’t exactly a featherweight, its light enough that most riders should be able to get it back up without assistance when it falls. As an aside, if you drop your bike and are unsure of how to right it, this video will be a big help. 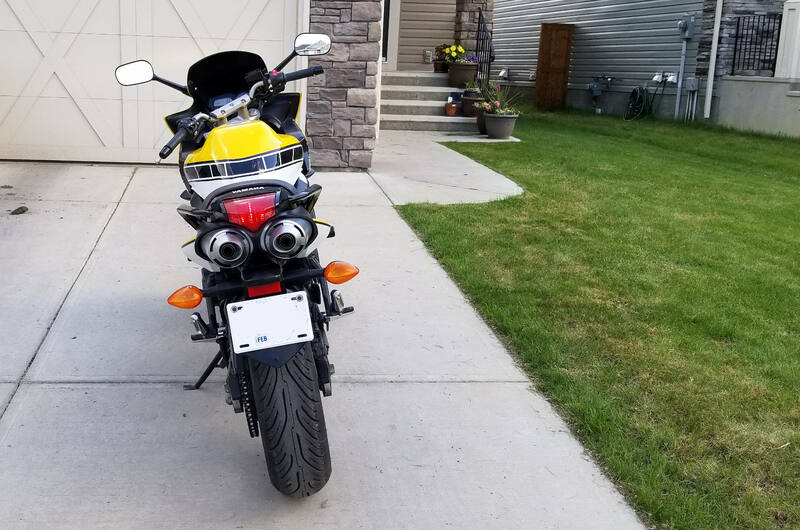 I suppose that I enjoy the FZ6 more than someone that’s been riding for 10 years “ought to”. After all, by now I should be riding big KTM’s or Suzuki’s with monster engines and insane power ratings, right? But no- I love motorcycling, but I don’t love machines that I don’t feel I can control. In a bike like the FZ6, I know that the limits of this bike exceed my abilities as a rider, and that’s a humbling position to be in. For new riders looking to gain experience, the FZ6 Fazer is, in my opinion, one of the best options around. They are widely available and equally as widely lauded for their competency, value for money, approachability, and fun factor. 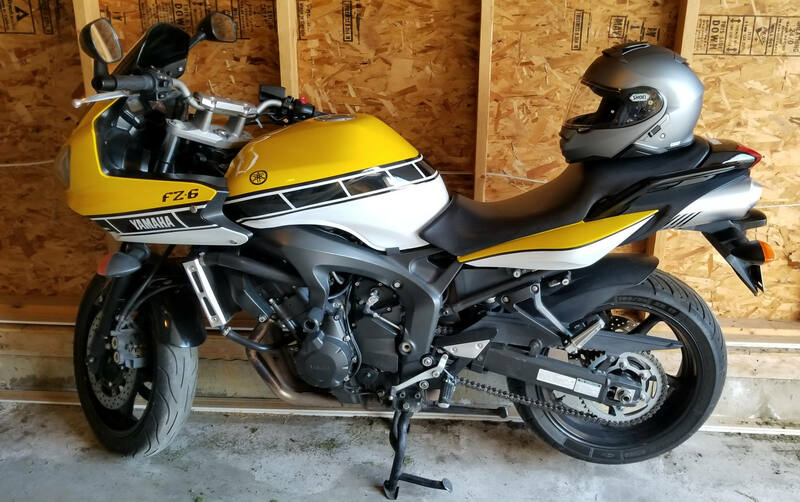 For a new rider looking for a bike that they’ll get numerous years out of, Yamaha’s FZ6 is an excellent choice.